‘All things are difficult before they are easy’. This is ‘wisdom to remember’ for Aaron and his partner Emily. And it’s certainly been that way for them on their property and life journey. As a young man Aaron was as a plasterer/carpenter with a team of 10 people. Because he was on a high income, he was able to accumulate a big property portfolio using ‘normal’ buy and hold strategies. However, he made some mistakes in this process. For example, he lost $30,000 after buying at peak of the market in a capital city. And a ‘new build’ home he bought in a country town sold for only $10,000 more than he paid 9 years later! Then things got worse. His marriage broke up and in the months after he went through a period of suicidal depression. In amongst all that, he lost much of the wealth he had accumulted. When Emily met Aaron, she was a broke actor, basically living ‘hand to mouth’. Surprisingly, despite being a low income earner, through the ‘power of collaboration,’ she had done around 8 deals in 3.5 years before she met Dymphna. At one stage buying possibly one of the cheapest homes in Australia… For a grand sum of $1,000! However, because there were gaps in her strategy, she hadn’t accumulated much money in the process. So, she had a ‘past’ in property to let go of before she could move forward. They both had strengths they could bring to the table – Emily primarily in deal-finding, and fostering relationships. And, Aaron as a master tradesman! They say, ‘when the student is ready, the teacher will appear’ and that was 100% true in this instance. That’s because by the time they met Dymphna at her flagship one-day event they were frustrated and worn out. Aaron was travelling two and half hours a day to and from work in Melbourne – despite only living 15km from work! That’s how bad the traffic was. It was soul destroying and energy draining. Meanwhile, Emily was starting a business working from home… Which was very mega stressful because she was burning through money like no tomorrow. It just wasn’t working. They knew they had to try something new. So, they decided to move to the tropical Sunshine coast. Because as Aaron said: ‘We’re not a tree, we can move’. So, they sold all their stuff on Gumtree and moved to Queensland. It was at this time, they decided to start focussing on property full time. Coincidentally enough, this was also the time they got a completely unexpected call. They were invited to be on the TV Show Property Flippers, on the basis of some Renos they had done previously. The crazy part is, at this stage of their life, they had virtually no money. In fact, Emily had taken on a ‘commission only’ role selling ad space for a tiny local newspaper. And, because the house they were renovating was so noisy she had to work in the park! This was earning them just enough to buy food. Despite their “T.V Celebrity” status, they were still doing it tough. Meanwhile, they were living on site at the reno, which wasn’t pleasant because there was plaster dust in everything! Plaster dust coated corn flakes is not a great start to the day! Throughout this renovation, they learned a lot about what NOT to do. For example, one of the big lessons, was don’t live on site – because that’s a recipe for time blow outs. However, they got there in the end and they turned an ugly duckling into a swan. Not bad for 6 months work. But don’t ask them to go through it again, or they might try and kill you – or kill themselves! “When you have a cookie cutter strategy that works and makes you money… Keep cutting cookies”. Then it was onto project #2. Now, with project two, they didn’t try and ‘scale up’ the ladder of complexity. Nope – they did what Dymphna always says: “When you have a cookie cutter strategy that works and makes you money… Keep cutting cookies”. The advantages of this ‘rinse and repeat process’ are savings in both time and money. That’s because you make decisions quicker. Plus, you can get better prices, terms and turnaround times from trades and suppliers. All of this helps reduce your holding costs, and project costs which then goes direct to your bottom line. In fact, in this project they were able to get similar finance to their previous project in just 6 weeks, that took them 6 months last time. And again, the finished product looked amazing. In this deal, they borrowed money from a private lender for this property – so they had to pay back $10,000 to them. However, to balance that out, they also made $11,979 profit while it was on the market renting it out via AirBnB. Clever move! These are the sort of innovative strategies, that allows I Love Real Estate Students to get ‘more bang for their buck’ from each project – while everyday investors settle for ‘average’. After this, they moved up to the next level of the profit ladder with three subdivision projects in the pipeline. They are also using the ‘HMO’ Strategy (House in Multiple Occupancy strategy) to earn $300 per week positive cash flow off a property they don’t’ even own. 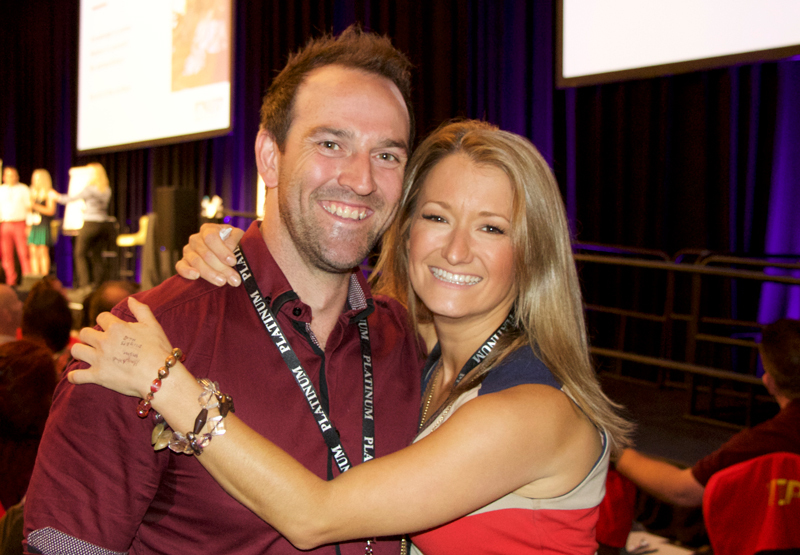 In yet another deal, they made $100,000 profit on a property – they never even settled on – all within 6 weeks! The secret of this was by getting what’s called an ‘option’ on the property. This is where you pay a set amount of money to buy a property at future date for a fixed price. As part of this deal, they also got access to the property right away, so they could go in and renovate and to add value. Their most recent project that they have currently settled on, saw them teaming up to joint venture with the owner of a home in South East Queensland who found herself financially compromised and needed to sell. 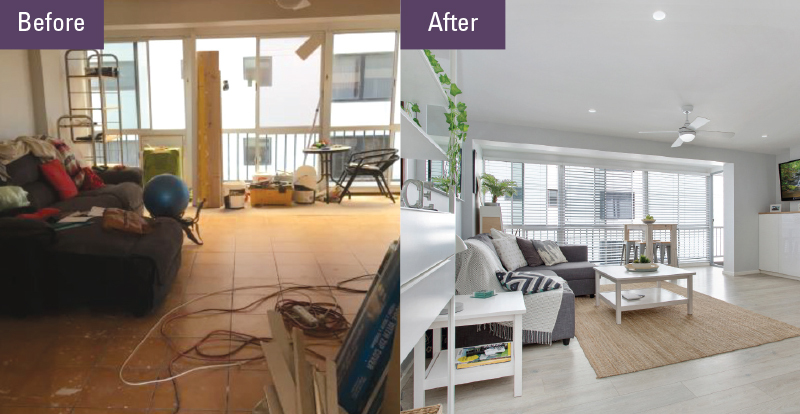 After a 6 week renovation, Aaron and Emily increased the value of the property by $220,000, which after costs, was split 50/50 between themselves and the owner of the property. The result was a $75,000 profit from a property that they never even owned, and the owner was able to walk away with a life changing amount of profit. And to top it all… As of writing, they are about to settle on a ‘buy and hold’ reno home which will be their principle place of residence – in beautiful tropical Queensland. So, it’s been an incredible journey for them both – and they’ve never been happier. Here’s one of the biggest lessons they’ve learnt. You’ve got to know what your strongest role is. For example, they’ve worked out Em’s strongest role is NOT being hands-on on site. This costs them money, because she could be out finding lucrative deals. Plus, Az claims he works faster when she’s not on site! Because they are not at each other’s throat! Em’s best role is project manager, deal finder, negotiator and then styling the end product. While, Az with his background as master tradesman, can get epic results done on a work site ultra-quick.